Domestic sows commonly experience depressed fertility in late summer and early autumn. Increasingly, evidence suggests exposures to high ambient temperatures during early pregnancy negatively affect pregnancy outcomes. Betaine, a widely available dietary supplement, acts as a potent organic osmolyte and major dietary source of the methyl groups required in methionine formation and subsequent DNA methylation. DNA methylation is especially important during embryogenesis. Large quantities of choline, the precursor of betaine, are transported to the developing embryo and low betaine levels are associated with abnormal pregnancies in humans. 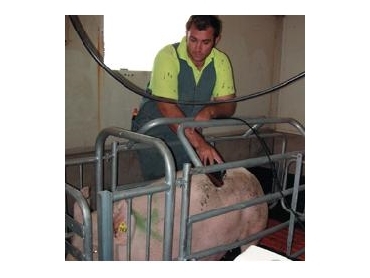 The aim of a study by Dr William van Wettere (University of Adelaide) and Dr Paul Hughes (SARDI), supported by Pork CRC , was to determine if supplementing gestation diets with betaine would alleviate the negative effects of high ambient temperature on pregnancy outcomes and increase litter size. A total of 450 sows (parities 1 to 7) were used in this study. Sows were mated between January 11 and February 11, 2008 and received a standard gestation diet (n = 221) or a betaine supplemented gestation diet (n = 229) for the duration of pregnancy. All sows were fed at the same level during gestation, with the betaine inclusion rate altered during gestation to ensure a daily intake of between 6.5 and 9.0g/ sow. The present findings demonstrate that betaine supplementation of gestation diets increases number of piglets born and number of piglets born alive, 0.6 and 0.5, respectively. Importantly, the beneficial effect of supplementary betaine was most pronounced in older (parity 3 - 7) sows. There was also a tendency for a lower proportion of betaine-supplemented sows to lose their pregnancy after day 36 of gestation.